Toledo Roof Repair provides chimney construction, inspection services, and repair solutions. You can rely on us to help you create and maintain the perfect indoor atmosphere – including a cozy fire from your well-maintained chimney and fireplace. 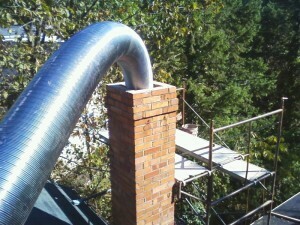 When you need state of the art chimney construction and maintenance, we’re the professionals to call. We’ll help keep your family safe and warm. Toledo Roof Repair provides the highest caliber of chimney services for your home. The firebox where the fire is lit. The damper that closes and opens to control the draft. The chimney flue liner for cracks, holes, or damage. The spar cap/arrestor on the chimney. The height of the chimney (which should be 3ft. above the roof-line). Over time, masonry chimneys can weaken and begin to degrade. The mortar starts to become soft because of age or moss buildup and then it begins to fall off in chunks. Brick faces may also fall off because of freezing water. Crown mortar can begin to soften and pit and develop cracks. We provide stainless steel two ply lining installations for both gas and oil venting flues as well as for oil to gas conversions. Practically every masonry chimney which has a wood stove that is attached to it ought to have a stainless steel liner for both efficiency and safety. 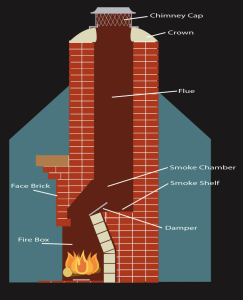 When chimney fires occur, they are usually attributed to unlined chimneys. When the clay liner collapses, this can cause flue gases as well as carbon monoxide to infiltrate living spaces.